How Do I Look After My Kids Teeth 1 to 12. Visits 1 to 12 to GarGar The Dentist. Retired Australian dentist Garth Pettit, beloved and known to children throughout the world as “GarGar the Dentist,” has combined his twelve short How Do I Look After My Kids Teeth? e-books into one comprehensive collection that both children and adults will enjoy and learn from. 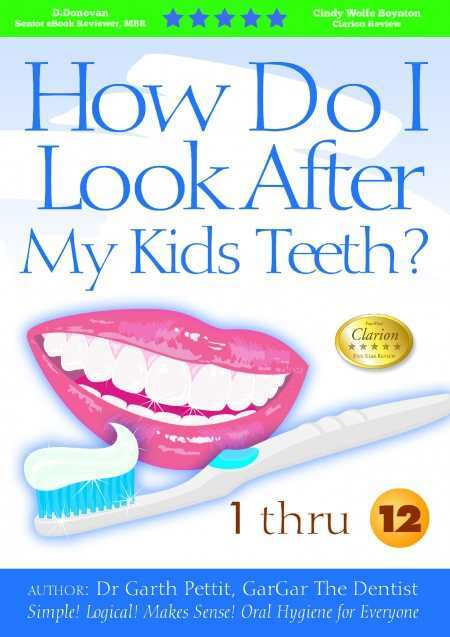 Available as an Amazon Kindle e-book, How Do I Look After My Kids Teeth? 1 thru 12 succinctly illustrates through words and pictures Pettit’s “Paint Your Mouth” approach to oral hygiene which, the author explains, kids find much more appealing than being told to “brush [their] teeth.” Adding to the fun is the fact that the book is narrated by Pettit’s alter ego, the smiling, animated GarGar the Dentist. Along for the ride is a menagerie of kid-friendly helpers like Booksie Owl, Croc-O-Smile, Grinny Squirrel, and PadPaw the rabbit who, as members of the SmileShine Gang, offer oral health tips and reminders. Original songs such as “Mouth Painting I Will Go” sung to the tune of the familiar children’s song “A-Hunting We Will Go,” also effectively and cleverly disguise learning, as do the Treat Stamps kids can earn for correctly answering questions. The book also includes drawings, quizzes, and other activities the SmileShine Gang encourages families to do together. Pettit states that he wrote the twelve How Do I Look After My Kids Teeth? e-books to reinforce the lessons kids were hopefully already receiving from their own dentists, schools, and parents. He also wanted to make good oral care something kids would want to do, while understanding why they need to do it. Without a doubt, Pettit took the right approach. In addition to being written in a kid-friendly tone and including effective graphics, chapters are broken into short, readable sections that can be consumed all at once or bitten into one small chunk at a time. Sophisticated dental and medical information is presented in a simple, straightforward manner, and, at the end of each chapter, both parent and child can show off what they have learned with a printable “4 Your Smile to Shine” certificate of achievement from GarGar that will look great on any refrigerator door. How Do I Look After My Kids Teeth? 1 thru 12 is a well-written, effective, and valuable learning tool for adults and children alike.